I was wondering how far into detail I should go in this sew along. I decided since we were doing a beginner’s skirt version, we should be considerate of beginners and really get into the nitty-gritty of making this skirt. Some of this may be too beginner for you, but maybe we can get some tips from each other. This is your view of the back of the pattern envelope. 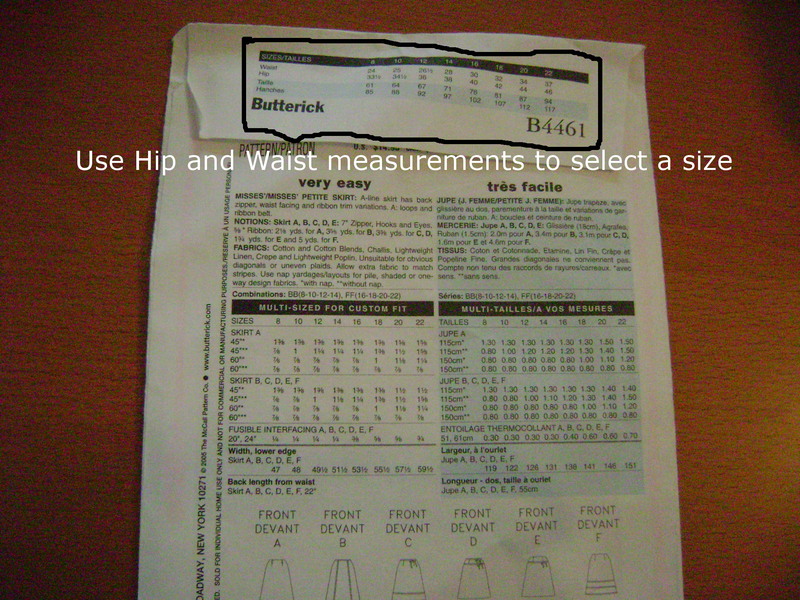 The top flap has a guide to help you use your measurements to choose which size to make. 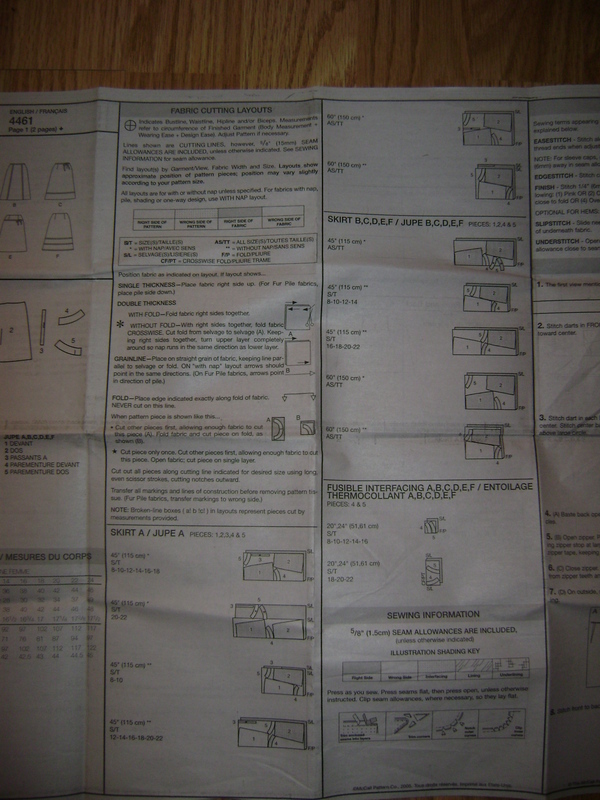 This section gives you a description of the garment you are about to make. Under the Notions section you are told of any extras you will need to complete the garment, in this case you will need a zipper and maybe ribbon depending on the version you are making. The Fabrics section tells you which fabrics and weights of fabric will work best for this particular pattern. This section tells you how much fabric to buy. Most fabrics come in 44 inch and 60 inch widths. I used a 60 inch fabric that did not have any nap or directional print to worry about, so I needed 7/8 yards. You can also see you need fusible interfacing here which comes most typically in 20 to 22 inch widths. For this skirt a light weight fusible interfacing works fine. The directions that come inside the envelope are very helpful. 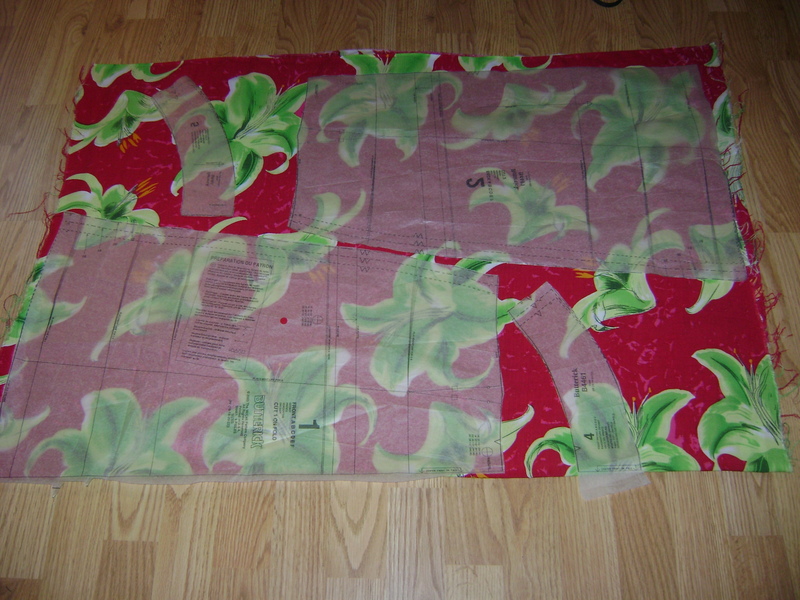 In this shot it is showing you how to lay out your pattern pieces to best fit the width of fabric you bought. 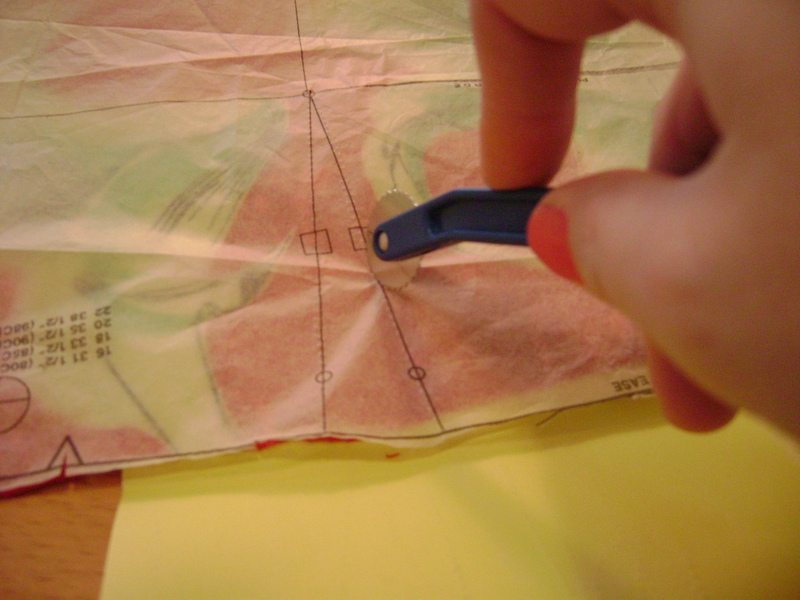 Go ahead and cut out your fabric pieces along the line designated for the size you chose to use. In my case I am following the line for a size 20. By the way, don’t let the sizing turn you off. 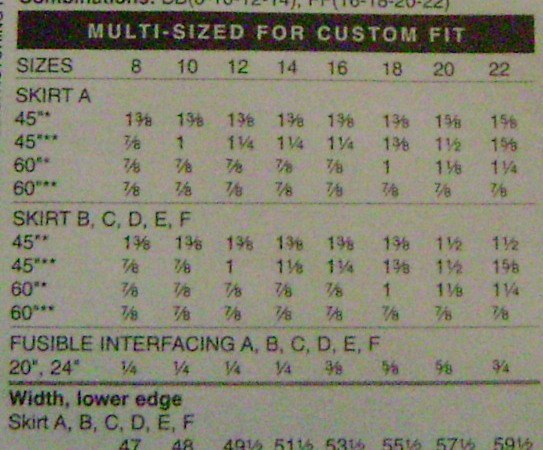 It was disheartening to need a size 20 pattern, but pattern sizes are different from your ready to wear sizes. I wear a size 12 in ready to wear clothing, but if I tried to make a size 12 in this skirt to save my pride I probably wouldn’t be able to fit the skirt over my hips! After I have cut out my pattern pieces I like to iron them on a very low setting to help flatten them out. At this point I also iron my fabric I will be using to remove any wrinkles. Creasing and wrinkles in pattern pieces or fabric during this stage can really affect the fit of your skirt later on. 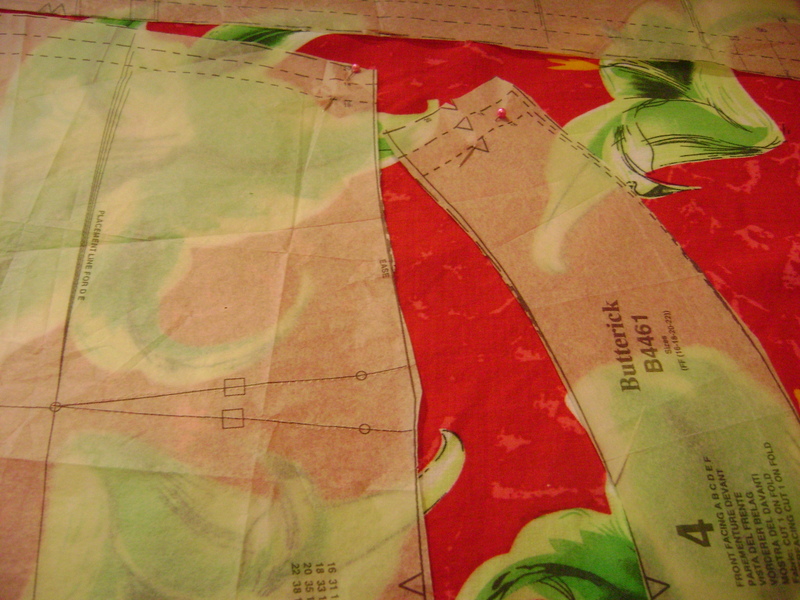 Here is how I laid out my pattern pieces on my fabric. I like to lay them all out before I cut or even pin just to be sure they fit. 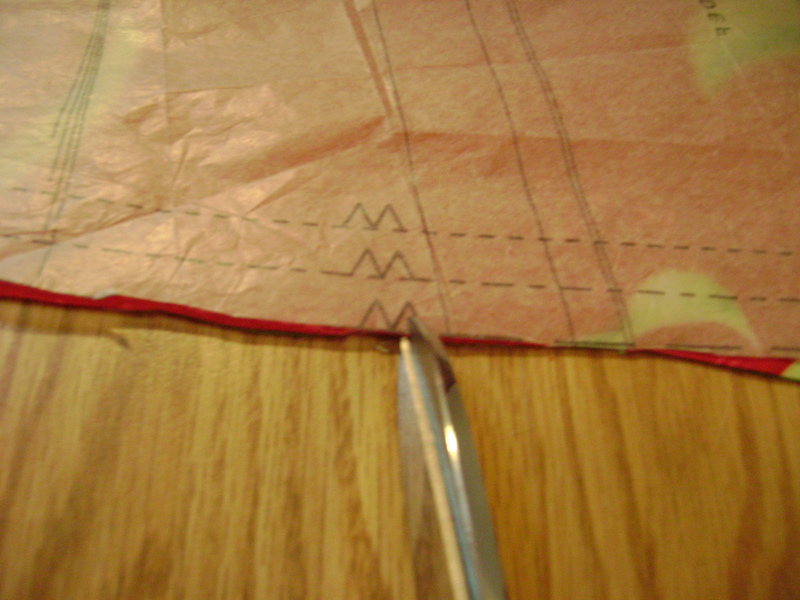 In this photo I have placed a few pins just to keep the fabric and pattern from moving while I cut them. As I cut out pieces I like to cut little notches where you see these triangles. These are used later to make sure your pieces are lined up as you are sewing. This marking here shows we will have a dart. There will be a dart in both sides of the skirt front and back pieces. 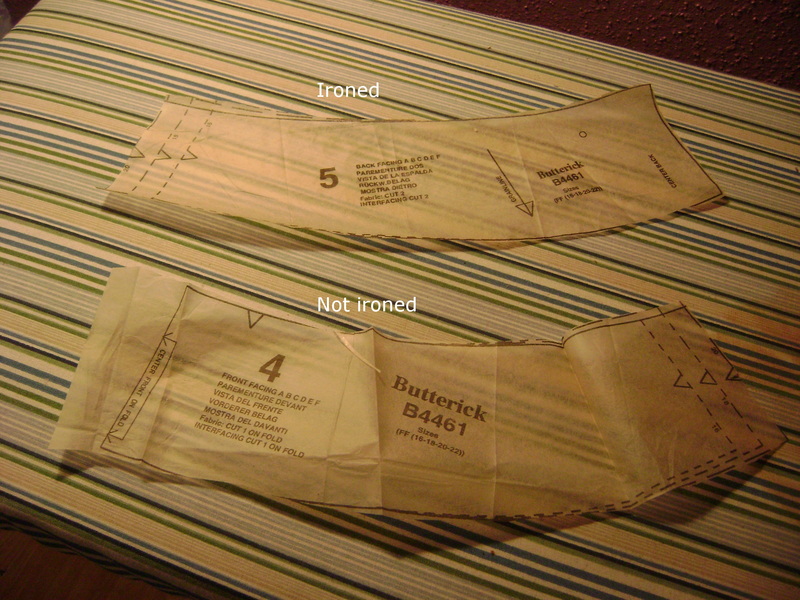 It is important to mark these before you begin to sew because they are the very first thing we will sew. There are several ways to mark darts depending on your preference. Frixion Pen – this pen is sold in office supply stores. It irons invisible and washes out. Tracing paper and wheel – the paper comes in several colors and makes a light mark that fades away or is washed out over time. Tailor’s Chalk – This is a waxy type of chalk that washes out. 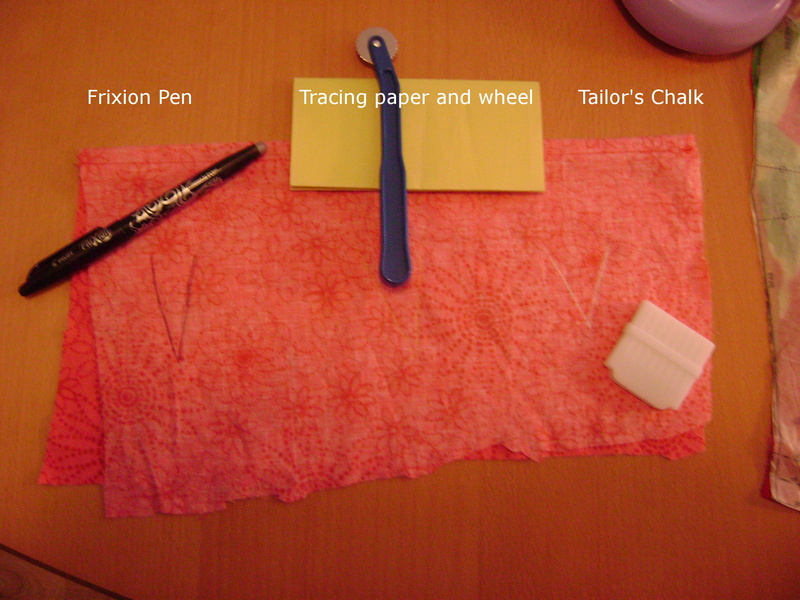 For this project I am using my tracing paper and wheel, but there is no one right method to marking fabric. It all comes down to personal preference. When I was first starting, I even used regular pencils and ball point pens, so don’t feel like you have to go buy something fancy. To use the tracing paper, I slid the folded paper in between the layers of fabric with its chalky sides out. 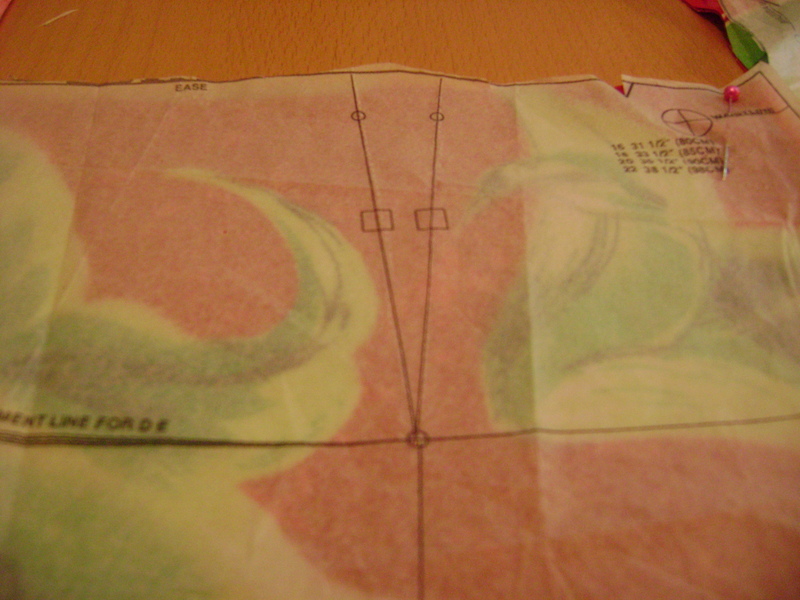 I then used my tracing wheel and heavily went over the lines of the dart to insure the markings would be visible. You have officially marked and cut your fabric! Please feel free to share if you have another method that works for you or if you have any questions. 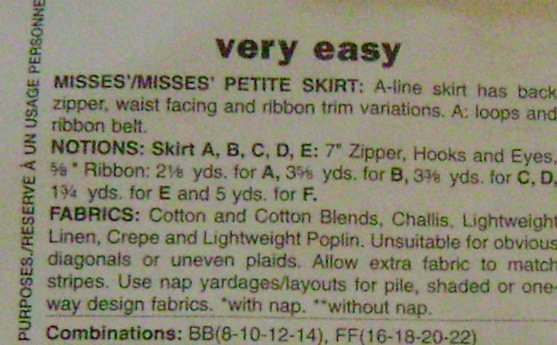 This entry was posted in Clothing, Project Tutorials, Sewing FYI and tagged butterick 4461, sewing tutorial, skirt sew along on March 11, 2012 by staciethinks. keeping newbies in the loop!! this info, and do it with her.. I intend on getting the pattern this week, for me to do now with this sew a long..But will do it again with Emily. What a fun idea! I hope you both get to have fun with it. Writing the beginner stuff is harder than I thought. I feel like I am forgetting things as I go because it comes so automatically now..
No problem! I am glad you are enjoying it!